As he crusades across Europe, the governor is acting like the leader of a sovereign country—an alternative to the United States in the Trump era. VATICAN CITY—On his way to the United Nations climate talks in Bonn, Germany, this week, Jerry Brown stopped over at the Vatican, where a doleful group of climate scientists, politicians and public health officials had convened to discuss calamities that might befall a warming world. The prospects were so dire—floods and fires, but also forced migration, famine and war—that some of the participants acknowledged difficulty staving off despair. “There’s nothing that I see out there that gives me any ground for optimism,” he went on. Still, he promised action: “I’m extremely excited about doing something about it." Even though President Donald Trump has abandoned the Paris climate agreement and called climate change a “hoax,” and even though he is proceeding to scrap the Obama-era Clean Power Plan and promoting the production of coal, Brown insisted to his audience at the Vatican that these policies do not reflect the true sensibilities of the United States. In the raw balance of power between a governor and a president, Brown has almost no standing abroad. What he does have is a platform, and a proposition: Crusading across Europe in his Fitbit and his dark, boxy suit, Brown advances California and its policies almost as an alternative to the United States—and his waning governorship, after a lifetime in politics, as a quixotic rejection of the provincial limits of the American governor. In the growing chasm between Trump’s Washington and California—principally on climate change, but also taxes, health care, gun control and immigration—Brown is functioning as the head of something closer to a country than a state. 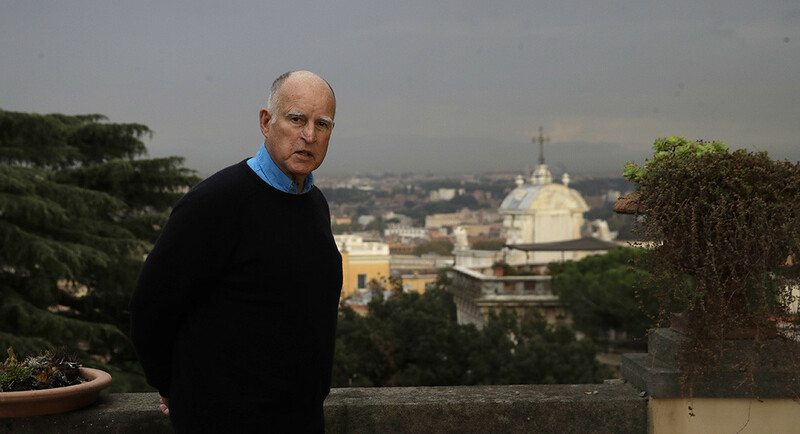 In his final term, Brown has lobbied other states and regions to reduce their greenhouse gas emissions, while augmenting California’s already expansive suite of climate change programs. But Trump’s election—and the specter of Brown’s own retirement—have lately set the governor on a tear. In a rush of climate diplomacy this year, Brown traveled to China to meet with President Xi Jinping, then to Russia to participate in an international economic forum. This past week saw him address lawmakers in Brussels and Stuttgart, Germany, and he was preparing for roundtable meetings with scientists in Oslo before arriving in Bonn for a climate conference, where Brown will serve as special adviser for states and regions. And he is preparing for California to host an international climate summit of its own next year in San Francisco. Now, Brown’s future rests on a family ranch in Northern California, where he is nearly finished building a remote, off-the-grid home. These days, he talks more about rattlesnakes and wild boar than the presidential election, and he has turned his focus from electoral politics to more existential concerns. Trump’s election nearly spun that vortex off its axis. In a state where Democrats had already battered Republicans to near-irrelevance, voters last year installed Democratic super-majorities in both houses of the state Legislature. They approved higher taxes and stricter gun controls, legalized marijuana and made certain felons eligible for early parole. They handed Trump the most lopsided loss a Republican presidential nominee has suffered in California in 80 years. Then they slumped in front of their TV sets as the rest of America went the other way. Now, the state Legislature and a large share of Brown’s constituents expected him to hoist it up—to assert California’s sovereignty in the Trump state. As Trump started dismantling his predecessor’s climate policies, Brown helped organize an alliance of 14 states and the island of Puerto Rico, pledging to meet their share of the U.S. commitment to the Paris climate accord. He redoubled his efforts outside of the United States, expanding on a joint project with the German state of Baden-Württemberg: recruiting nearly 200 mostly subnational governments to sign a nonbinding pact to limit global temperature rise to below 2 degrees Celsius, the threshold beyond which many scientists predict environmental catastrophe. On top of that, Brown negotiated legislation extending California’s signature cap-and-trade program for an additional 10 years, then signed an agreement with leaders of Ontario and Quebec to integrate their cap-and-trade systems with California’s. Trump’s election shook Brown and his home state in other ways, too: California relied on billions of dollars in federal health care funding that Trump threatened to undo, and the president’s hard line on immigration sowed fear among California’s large population of undocumented immigrants. When the Trump administration started conducting immigration sweeps in Los Angeles, protesters strung “No I.C.E” signs from freeway overpasses, and Brown—who had signed legislation granting undocumented immigrants driver’s licenses and access to college financial aid—negotiated state legislation curbing local law enforcement officials’ ability to cooperate with federal immigration agents. By this fall, California’s feuding with Washington had grown so routine that it barely registered as news when, during the span of seven hours one day last month, state Attorney General Xavier Becerra announced four separate lawsuits against the Trump administration on issues ranging from health care and education to immigration and oil extraction on public and tribal lands. Before Trump’s election, Brown existed largely at the margins outside California. When he returned to office in 2011, a fellow Democrat held the White House, and no one had to look West for an expression of leftist causes. In that context, Brown presented as a moderate, taking criticism from environmentalists for his permissiveness of hydraulic fracturing, while others dismissed as insignificant the nonbinding climate agreements he pursued. The nation’s most populous state was cleaving from Washington, and Brown was its marshaling force. Yet in the polished, grip-and-grin world of diplomacy, Brown can also seem out of place. He has sprinted through his trip on a borrowed charter plane with his tiny entourage—a handful of aides, a small protective detail and his wife and adviser, Anne Gust Brown, straightening his collar. He maintains an exasperatingly loose schedule, suffers posing for photographs and sometimes wanders on stage. Before he strode into the Vatican headquarters of the Pontifical Academy of Sciences, a 16th century summer residence for Pope Pius IV, Brown darted for a table of coffee and cookies that waiters were starting to clear away. “You had to eat, didn’t you, love?” his wife asked her husband, who has a sixth sense for free food. A year ago, it appeared that Brown might not be able even to do that. Two nights before the election, he was eating chips and salsa at an airport bar in Durango, Colorado, where he had spent the day campaigning for Hillary Clinton. If Trump took the White House, he said in an interview, it would be “game over” for climate change. “Game over,” he said again. Today, Brown’s mind is elsewhere. He deflects questions about his legacy, arguing, “Everything we’re doing can be framed as either a model for everybody else or building my legacy that I’m going to be reviewing in my dotage.” Yet the issues that consume him—climate change and nuclear proliferation—are legacy concerns of humankind. Brown has even discussed the possibility of creating some kind of meeting space on the ranch. Before he was to arrive in Bonn on Saturday, he left his aides behind and swung south to Bremen, Germany, to visit with Silja Samerski, who had once helped him organize a salon he called the “Oakland Table,” attracting intellectuals such as the late social critic Ivan Illich. “We’re going to talk about unfinished issues from the Oakland Table,” Brown said of his visit with Samerski. “The good life, and how are we supposed to lead it. What are we doing? So, that’s getting ready for the Colusa Institute,” he explained, laughing a bit. Colusa is the name of the county where he is building his ranch. Will America Ever Have a Woman President?